BANGKOK, THAILAND--(Marketwired - Feb 29, 2016) - Gaggan in Bangkok has claimed the top spot in the list of Asia's 50 Best Restaurants for a second consecutive year. 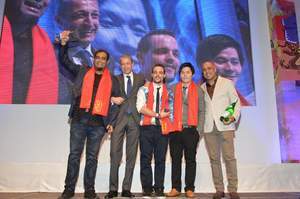 Asia's 50 Best Restaurants, sponsored by S.Pellegrino & Acqua Panna, revealed the 2016 list at an awards ceremony at the W Hotel in Bangkok, Thailand. Now in its fourth year, the 2016 list welcomes 10 new entries. With 13 nations represented, the 2016 list includes restaurants from more countries than ever before, showcasing a rich variety of dining experiences across Asia. Gaggan retains the dual titles of The Best Restaurant in Asia, sponsored by S.Pellegrino & Acqua Panna and The Best Restaurant in Thailand, sponsored by S.Pellegrino & Acqua Panna. Narisawa (No.2) is named The Best Restaurant in Japan, sponsored by S.Pellegrino & Acqua Panna for a fourth successive year. Rising two places, Chef André Chiang's Restaurant André (No.3) holds the title of The Best Restaurant in Singapore, sponsored by S.Pellegrino & Acqua Panna, for the fourth consecutive time. Amber (No.4) in Hong Kong reclaims the title of The Best Restaurant in China sponsored by S.Pellegrino & Acqua Panna, from last year's winner Ultraviolet (No.7). Entering the list at No.15, Mingles in Seoul claims the Highest New Entry Award, sponsored by John Paul, and also earns the title of The Best Restaurant in Korea. Gallery Vask (No.39) in Manila is awarded The Best Restaurant in the Philippines while Locavore (No.49) in Bali is named the The Best Restaurant in Indonesia. Indian Accent rises 13 places to No.9 to be awarded The Best Restaurant in India for a second year. Le Moût (No.30), retains The Best Restaurant in Taiwan title while Ministry of Crab in Colombo (No.31) secures honours as The Best Restaurant in Sri Lanka. Cuisine Wat Damnak (No.43) returns as The Best Restaurant in Cambodia. Chef Mingoo Kang reinvents Korean cuisine by fusing local ingredients with Western influences. Florilège in Tokyo is dedicated to modern French cuisine presented with impeccable style. Using inspiration from her travels, Singapore-born Cheryl Koh launched Tarte in April 2015. Paul Pairet earned the respect of his peers with his two influential Shanghai restaurants, Mr & Mrs Bund and the avant-garde Ultraviolet. A Tokyo favourite, Quintessence (No.20) rises 29 places from last year. Chef Margarita Forés from the Philippines is named Asia's Best Female Chef 2016 while David Thompson is this year's recipient of The Diners Club® Lifetime Achievement Award. William Drew, Group Editor of Asia's 50 Best Restaurants, said: "Asia's 50 Best Restaurants strives to reward creativity as well as culinary excellence and all 50 restaurants on the list, as well as the individual award-winners, exemplify these qualities." 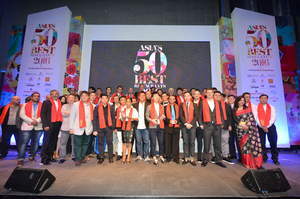 Asia's 50 Best Restaurants is created by The Diners Club® Asia's 50 Best Restaurants Academy, an influential group of over 300 leaders in the restaurant industry across Asia. For the 2016 edition, Asia's 50 Best Restaurants is working with professional services consultancy Deloitte as its official independent adjudication partner. Asia's 50 Best Restaurants list is published by William Reed Media Group, which also publishes The World's 50 Best Restaurants, launched in 2002, and Latin America's 50 Best Restaurants, launched in September 2013. Thai food is among the key magnets that draw visitors across the globe to Thailand. Thailand has also become a gourmet's playground with the best of the world's cuisines represented. The nation's kitchens and restaurants produce dishes traditional and innovative, local and global, but always delicious and everyone is welcome to sample its unique flavours. S.Pellegrino and Acqua Panna are the main sponsors of Asia's 50 Best Restaurants. S.Pellegrino and Acqua Panna are the leading natural mineral waters in the fine dining world. Diners Club International® - Official Financial Services Sponsor, sponsor of The Diners Club® Lifetime Achievement Award and The Diners Club Asia's 50 Best Restaurants Academy.